Have you heard the good news?? 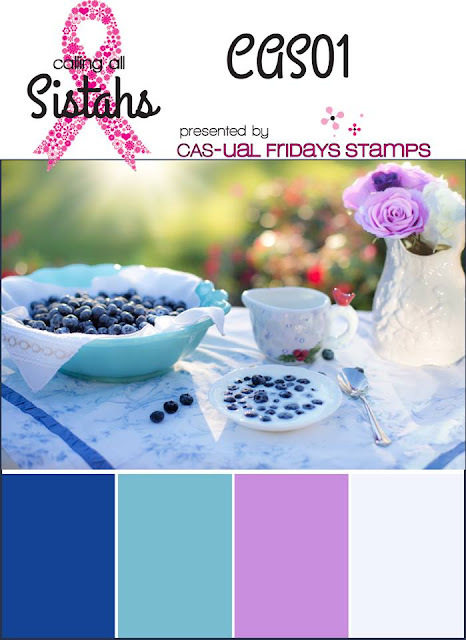 CAS-ual Fridays Stamps has a brand new Challenge and it starts today! I am one of the lucky ladies who was invited, by the owner Michele Gross, to be a part of the new Design Team for the Encouragement Squad! Each month on the 17th the Encouragement Squad will be showcasing their Calling All Sistahs Reminder cards and then on the 18th of each month the Encouragement Squad will have an inspiration picture for the challenge! So today is the start of the first Encouragement Squad Challenge and here is a picture to give you some inspiration! For this A2 card I started with White card stock for the base of the card. I took a piece of Lemoncraft Daydream paper, inked the edges with Picked Raspberry distress ink and then added that to the card. I took some VersaFine Deep Lagoon ink and stamped the sentiment from the Calm and Gentle stamp set inside the Dream Catcher. I took the same ink and stamped the sentiment the Breath stamp set on the bottom right hand corner. Lastly I took some sequins from the Limited Edition Sistahood Sparkle sequin mix and glue them onto the card. I really love the colors on this paper. 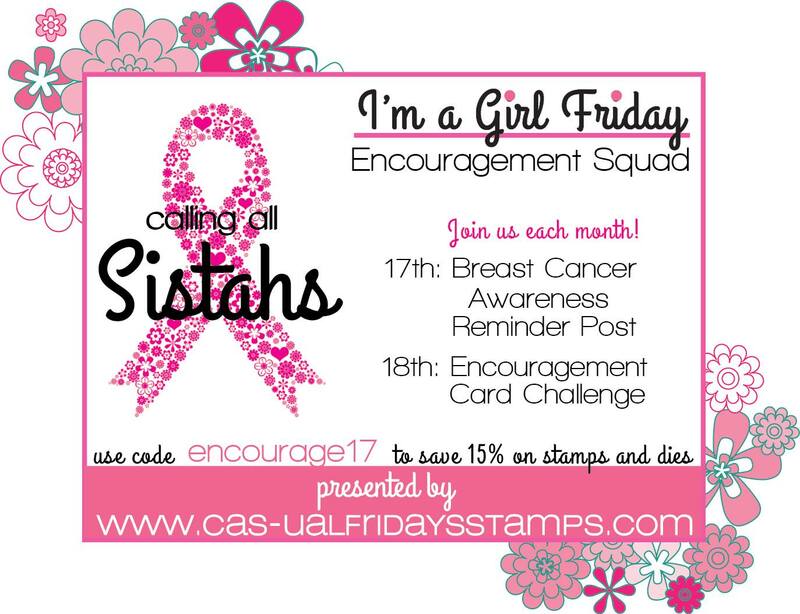 Be sure to stop by the CAS-ual Fridays store to see all the wonderful stamp sets there are to make cards of encouragement with!! If you decide that there are one or two stamp sets that you just have to have then use this code encourage17 to get 15% off stamps and dies!! Don't forget to stop by the Encouragement Squad post to see all the lovely creations that the new Design Team have made. Now it is your turn to create something for this challenge!! There will be a prize of a $25 Gift Card to use at CAS-ual Fridays Stamps, that will be doubled if your use CAS-ual Fridays products for your card!! I hope I have inspired you!! This is jaw dropping GORGEOUS, Lori! Is the dreamcatcher image on the patterned paper? It's beautiful!!! Gorgeous card! Love the papers and your color choices are wonderful. Wow really amazing card Lori. 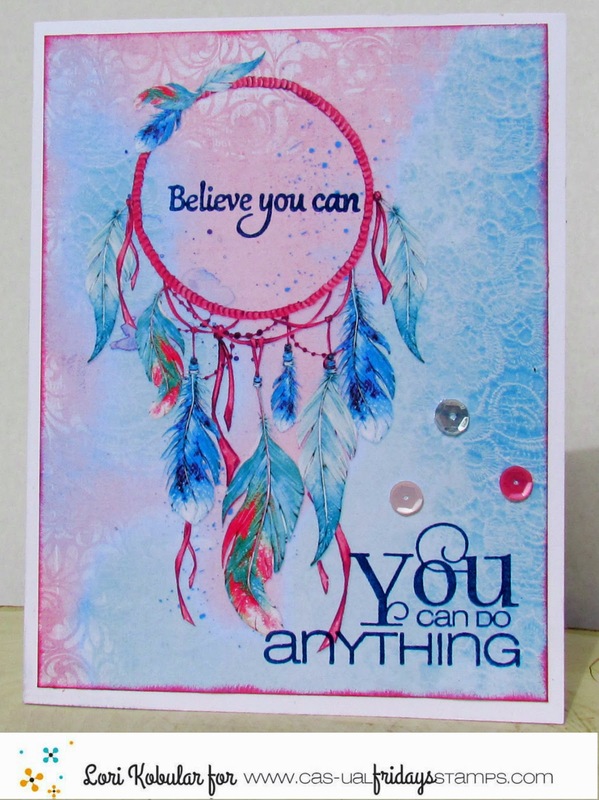 I actually thought the dreamcatcher was an add on, that paper is dreamy! Very gorgeous Lori! At first I thought the dream catcher was a stamp and was going to ask you how you colored it so gorgeously. But I saw your reply to Patti that it's part of the Lemoncraft paper set. That's is a beauty! And congrats again on making the team! Hugs. Your card is so dreamy, Lori. (pun intended) Love the way the dreamcatcher looks with these colors. Thank you for being a part of the Encouragement Squad!